In the summer of 2004, God brought me to a deep place of brokenness. I had served as a youth pastor for ten years. Amy and I had been married for the same amount of time, and God had blessed us with four children. The problem was that my heart was at work, not at home. My passion was to make disciples of the children and youth at church! But I had no vision, and no plan to disciple my own children. I was a spiritual leader at church, but passive at home. God brought me to repentance, and turned my heart to my most important ministry – leading my family to love and follow God. The church in North America is facing a crisis. We are losing the majority of our children to the world. According to a range of studies, between 60-80% of children growing up in our churches today are leaving the faith when they become adults. How could this happen? What can we do about it? Can anything be done to keep our children out of these statistics? For many, the first response to this crisis is an urgent call to improve the youth and children’s ministries in our local churches. But the reality is that we have the biggest and best children’s and youth ministries the world has ever seen. We have paid church staff, caring volunteers, Christian education rooms, great curriculum, and more. The fundamental problem is not the local church, but rather the Christian family. Up until the early 20th century it was commonly understood that the spiritual training of children was the responsibility of parents and grandparents in the home. In Matthew 22, Jesus points us to the most important commandment in the Bible, which is found in Deuteronomy 6. Immediately following the Great Commandment, God focuses our attention on family life. He speaks specifically to parents to live out their love for Him by doing all in their power to pass their faith to their children. Are we serious about loving God? Then we must be serious about teaching God’s Word diligently to our children. This is the first mission God gives to us after the most important commandment in the Bible. Here we find the purpose of parenting and grand-parenting: to impress the hearts of our children with a love for God. At the heart of the Great Commandment is family discipleship, with parents being the primary spiritual trainers of their children. There are many habits and practices that can spiritually enrich and strengthen your family. Share meals together. Serve your neighbors. Volunteer at church together. Participate in short-term family mission trips. But these are all “icing on the cake.” In order for the icing to “stick” you first have to make a cake. 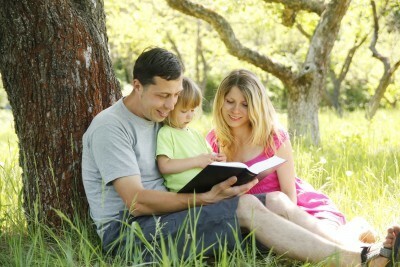 Bible reading is the heart of family worship. God calls heads of households to bring the family together in the home for what is referred to in Christian history as “family worship.” “You shall talk of [the Word of God] when you sit in your house.” Family worship is the time when a household gathers for prayer, Bible reading, and spiritual conversation. Your family eats physical food together in order to nourish your bodies. Family worship is a spiritual meal to nourish your souls. Has God convicted you to increase the spiritual life in your home? Has God convicted you to take the lead in seeking to impress the hearts of your children with a love for God? Consider mixing and matching these five elements as you grow in the practice of family worship. Some of the best times of family worship in our home are when we put some energy into preparing a simple activity which helps us get into our Bible reading. This is particularly helpful for younger children. We often play Bible charades. Invite someone to act out a story from the Bible while others try and guess what it is. Look for simple object lessons which explain spiritual principles. Do you have children with a wide range of ages? Ask the older children to plan an activity for the younger ones. God loves it when we sing to Him! When we sing we draw close to Him and to one another. You don’t need to be musically gifted. Put in a worship CD or DVD and sing along. If you begin singing with your children when they are young, you will grow into a family that sings together for generations to come. This is the heart of family worship. What your children need more than anything else is to see you open God’s book and read it with a believing heart! Some days you may simply read a single proverb. Other days you may read a few chapters from a Gospel. The Word of God is living and active (Hebrews 4:12). The Word of God is able to make you wise unto salvation (1 Timothy 3:15). The enemy will do everything he can to keep your family from reading the Bible together. This is where the power is to transform your hearts and renew your minds! Talk about the Scriptures you read. What truth did you learn from God’s Word? How does that truth apply to your life? Some parents are afraid their children will ask questions to which they don’t know the answers. Don’t worry! Encourage all kinds of questions. Take them to your pastor. Take them to the Lord in prayer. My favorite part of the day is when our family of eight get on our knees around our coffee table (our prayer table). We confess our sins. We thank God for His goodness and faithfulness. We pray for those who are sick and suffering. We pray for those who are lost, for them to repent and trust Christ. We pray for God to use our family and our church for His glory around the world. Don’t wait to start family worship in your home until you are a “better Christian.” Don’t wait for your schedule to become less chaotic. Don’t wait for your children to be a little older. Take action today to increase the prayer and Scripture in your home. Family worship is the most important “spiritual meal” your children need – without it they will likely be malnourished in their faith. True change begins with true repentance. If, like me, you have not been leading your family and your children spiritually, confess that to the Lord. Receive His forgiveness through Christ! Ask God to turn your heart to the ministry of your children. Ask Him to make it the number one mission of your life to impress the hearts of your children with a love for God. Confess also to your family. Tell them how God has convicted you and called you to grow in the practice of family worship. Share with them your fears and anxieties. Invite them to follow you, as you seek to follow Christ. Resource – The Holy Bible, English Standard Version “Scripture quotations are from The Holy Bible, English Standard Version® (ESV®), copyright © 2001 by Crossway, a publishing ministry of Good News Publishers. Used by permission. All rights reserved.”  Rob Rienow, When They Turn Away, (Grand Rapids, MI: Kregel Publications, 2011). Hello Dr. Rienow, I am so encouraged by this post. Your tips are easy to understand and right to the point. I pray that many families are blessed by this and that they put your practicle advice in action. Thank you for choosing to share your message here at WCWTK. Well done! Hello Dr. Rienow. What an excellent family foundation that you have revealed to us. Indeed, we would all be better off as the family unit not only taking these to heart but more importantly, in their application. This article reminds me so much of Eccl 4:12 I believe it is. Well done and thank you sir for contributing to WCWTK. YEAH, I LOVE IT TOO. MAY GOD BLESS YOU AMEN. I PRAY FOR MORE REVELATION FOR YOU INTO THE WORD AMEN. Dr.Rienow thank u so much for shearing such a Beautiful revelation with the world, may Heaven reward you. Thou my marriage is 3 months ahead, I wil practise this in my home with great. JOY. woah! what a great article,for some christian today doesn’t care for their children spiritually,by getting adult and turn another thing either terrorist or homosexual,the parent will now begin to blame God.